Today we wanted to share some fun activities for preschoolers that can help develop their fine motor skills. Why is it important for children to develop their fine motor skills? Being able to pick up small objects, color, open jars, and other activities that use the muscles of the hand are all integral to children’s development. As their skills develop, they will go on to learn more difficult tasks such as tying a shoelace and eventually writing words. Here are a number of activities your child might enjoy. 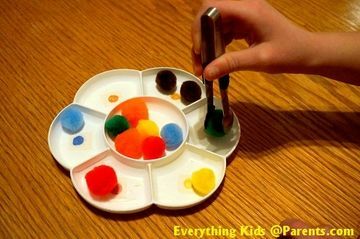 Pom-Pom Sorting: To set up this activity, just tape a small colored dot to the bottom of each section of the tray. Have the kids sort pom-poms into the correct compartment using a small pair of tongs. We used a plastic compartment serving tray for sorting. 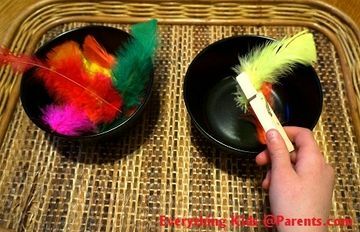 Feather Transfer: If kids can handle using tongs, they might be ready to try manipulating clothes pins. This is quite a challenging skill for some kids to master because it requires the thumb and finger to work together in a pincher grasp. They can start by trying to grasp something light like feathers and transferring them from one bowl to another. 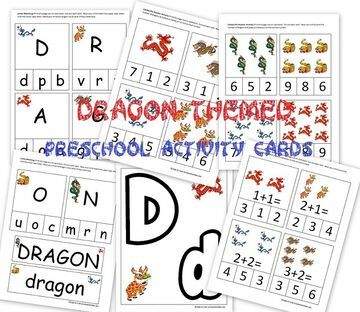 Counting and Number Recognition: Since today is the Chinese New Year, we made a dragon-themed set of printables that you can download and print out for your preschooler. 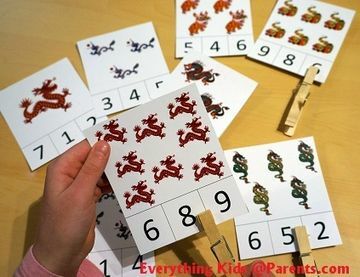 In the first activity, they have to count the number of dragons and place the clothes pin on the correct number . 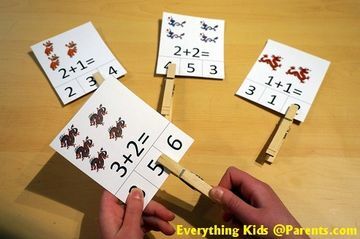 Basic Addition: We also included some very basic addition cards. Do-a-Dot Fun! 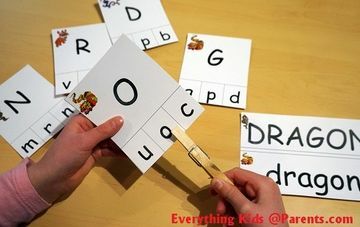 : We have a letter Dd sheet that the kids can decorate as well. 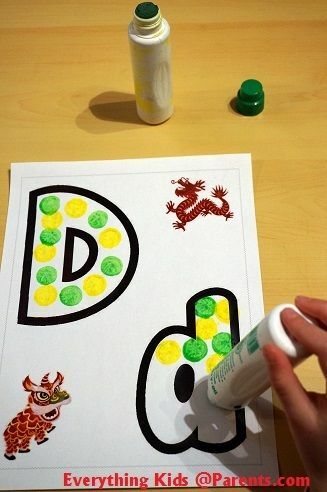 As preschoolers, my kids really liked the do-a-dot (bingo) markers, but they could also use the sheets to paint, color or glue on feathers, pom poms, or foam craft pieces. Pouring: Some skills require kids to move their wrists. This is called rotary motion. 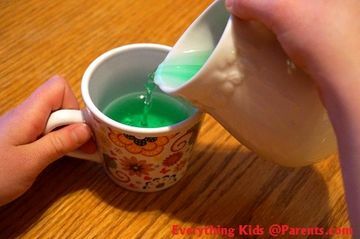 My kids always loved pouring (colored) water from a small pitcher. Other activities that work on this rotary motion might including twisting and taking the lids off jars and tubes, turning door knobs, and assembling nuts and bolts. 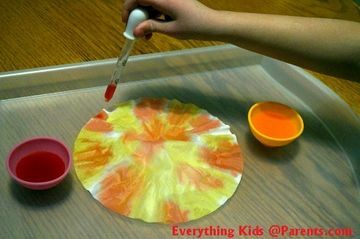 Eyedropper Art: Here is one final activity idea before we go. This one also involves the pincher grasp. Grab the food dye, coffee filters and an eye dropper. Add a few drops of dye to water. Show the kids how to squeeze the bulb and slowly release it in the water to draw up the liquid. Have them gently squeeze out the water to decorate the coffee filter. It takes a couple of tries for kids to get the hang of manipulating the eye dropper, but the designs they create are quite pretty! Other activities that encourage small motor skills include buttoning, zipping and fastening snaps on clothing. They also develop these skills while using a hole puncher, holding paper while cutting, and paper weaving. Some toys that really help with fine motor skill development include pop beads, peg boards, towers and blocks, play dough, and building toys such as Legoes, K-Nex, and Zoobs. Plus: Learn more about how your child will develop motor skills in preschool.